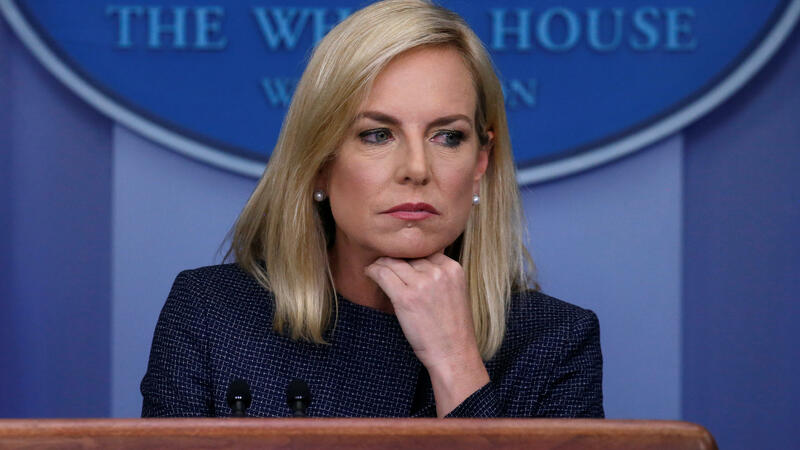 Homeland Security Secretary Kirstjen Nielsen, the face of the Trump administration's policy that has split up migrant families, was heckled inside a Mexican restaurant. She's seen here at Monday's daily briefing at the White House. Protesters yelled "Abolish ICE!" before launching into a chant of "Shame!" as Nielsen sat with an unidentified man (reportedly her chief of staff, Chad Wolf, who previously accompanied her to the White House state dinner for visiting French President Emmanuel Macron). As the protest group neared the DHS leader's table, they shouted, "Mic check!" The man seated with Nielsen folded up a tablet. For much of the protest, he and Nielsen stared down at their laps, presumably at their phones. "If kids don't eat in peace, you don't eat in peace," the protesters shouted. At one point, they played an audio recording of children crying inside detention centers after being split from their parents. Nielsen has been the face of the Trump administration's "zero-tolerance" policy, defending her agency's treatment of migrant families who enter the U.S. illegally — a policy that caused a firestorm of outrage after DHS said it had separated thousands of children from adults. As the controversy raged, President Trump said Tuesday that immigrants could "pour into and infest" the U.S., blaming the Democrats — who don't currently control either house of Congress. Local news outlet DCist (which is affiliated with member station WAMU) reports: "One of the protesters, Austin Kendall, told DCist that three people dining in the restaurant joined them, and demonstrators left the restaurant to applause." The protest and heckling went on for around 10 minutes. At one point near the end, Nielsen spoke briefly on a phone. Shortly afterward, she left the restaurant. "As always, our staff graciously serves all guests who walk through our doors, regardless of their political standing. Our staff, most of whom are Hispanic, have been with our restaurant family for many years. They represent hosts, servers, kitchen staff and upper management who take care of each and every guest who dines with us. We believe that a restaurant is a place to nourish the spirit of humanity, not to break it down. Our goal is to serve everyone to the best of our ability. Based on tweets (with thousands of likes) there was a call to action — to come to 600 14th Street and join the protest. MXDC managed the situation in the best interest of safety for everyone on June 19th as a result of the unusual situation."